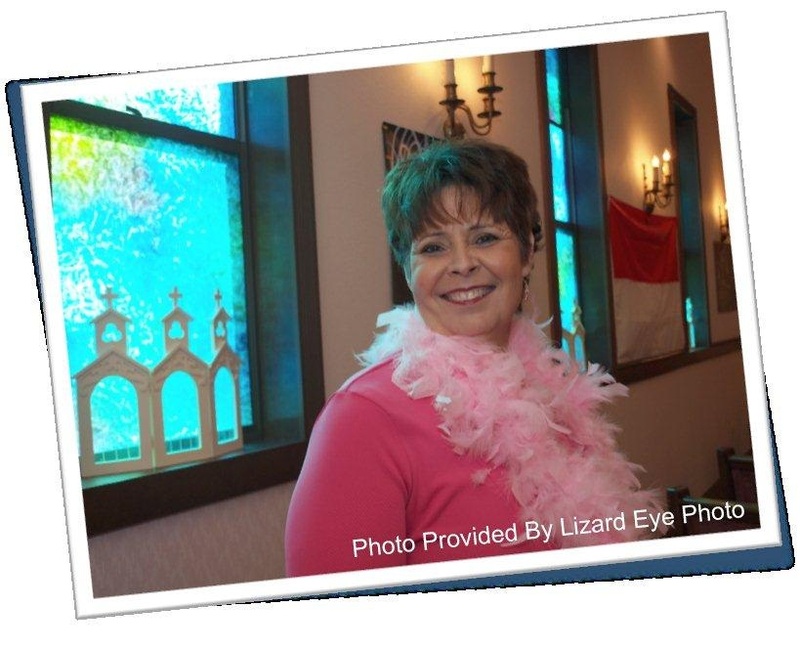 March’s Survivor, Marie Maddox, wanted her photo taken in her church, the place where she finds solace in this crazy world. We met one sunny afternoon and went into the sanctuary to take her photos. She came prepared with a bevy of pinkness! A feather boa, scarves, the sweater she was wearing, her bracelet… She told me a lot of what she wrote in response to her questionnaire when we met there that day. Her responses are extremely detailed and eloquent, so I’m not going to change very much at all. That day that we met and talked, she almost talked more about her sister than herself, ” The real cancer survivor is my sister, Micki Otto. I watched her go through the Chemo every three weeks that made her very sick for several days. We even made some trips to the doctors together as we had the same surgeon. She did lose her hair and had all the common known side effects of Chemo, but she has truly survived!! She just had her last Chemo treatment February 2. She was supposed to continue until the middle of March. The Radiologist ended them early because she was doing so well. There were weeks I wasn’t sure she would survive those treatments, but many were praying for her recovery and we knew God wasn’t finished with her yet. ” The bond between sisters, strengthened by a shared experience no doubt was very beneficial to their recoveries. “The positive enforcement from Susan G. Komen gives hope. Cancer is not the end of a woman’s life, but the beginning of a journey that we can make it through. To know that research is ongoing to cure this disease so that our daughters and other women will not be faced with this journey is encouraging to the survivors and other women all over the world,” Marie says of how Susan G. Komen inspires her life. “Support of Susan G. Komen for the cure is needed everywhere. The research being done to end the threat of breast cancer can save our mothers, daughters, sisters and friends from going through this journey. I witnessed both ends of the spectrum seeing my sister have stage 4 Breast Cancer to myself having stage 1. My sister did not have yearly mammograms done. I had one done every year. The one thing I would like to do in the effort to save lives is to stress” YEARLY MAMMOGRAMS FOR EARLY DETECTION! Breast Cancer does not have to be a death sentence.” Those were her parting words in her story she wrote for all of us and are great words to hang on to if you’re newly diagnosed or undergoing treatment.